The use of social media has meant the increase of prosecution of criminals. Find out why and write a report about it. It’s been said that social media leads to a better quality of life. Write an opinion article about this statement. Write an opinion article on the following statement: Students have lower grades because they’re spending too much time on social media. productive workers. Use evidence and your own personal opinions. Write about he pros and cons for businesses using social media. Write about how social media can be effective to help out when there are natural disasters. Write about the dangers of cyber bullying. Write about the dangers of sharing passwords. Make a list of 15 rules for the appropriate use of social media apps. Write an opinion article on this statement: Are social media sites addictive? Debate whether or not social media can be used effectively for homework. 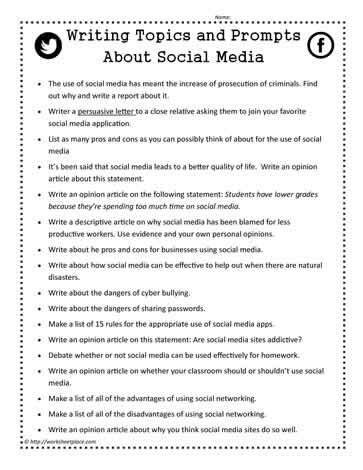 Write an opinion article on whether your classroom should or shouldn't use social media. Make a list of all of the advantages of using social networking. Make a list of all of the disadvantages of using social networking. Write an opinion article about why you think social media sites do so well.